If not corrected, your baby can also face challenges like speaking delays, speech impairments, and pain. Difficulty in nursing can also make it challenging for the baby to latch, making them prone to weight loss and colic. In the past, loosening a baby’s tongue-tie meant performing a frenectomy using surgical methods (a scalpel.) 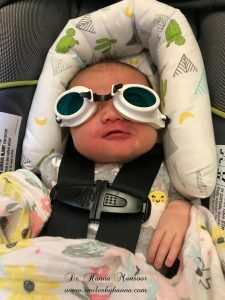 This, obviously, could cause more discomfort to the child and make the procedure more challenging to perform in regard to the infant’s safety. As such, some dentists refer parents to an ENT, oral surgeon, or require sedation for the infant to have the procedure. Additionally, tongue tie surgery where the tight skin is cut or trimmed poses a risk for infection and lengthy recoveries for the tiniest member of your family. Fortunately, Smiles by Hanna is able to offer a gentle and minimally invasive alternative to traditional tongue tie surgery. Dr. Mansoor incorporates gentle laser technology to provide safe and effective treatment and a fast recovery. Because our Biolase Waterlase laser uses gentle pulses of energy combined with a cool flow of water, your infant or toddler can have a laser frenectomy without the pain, bleeding, or swelling experienced using surgical techniques. Your infant will enjoy a painless procedure and rapid recovery. No sutures are necessary! The laser allows Dr. Mansoor to reshape the soft tissue under the tongue or behind the lips in a predictable manner for effective results. No! Waterlase technology is virtually painless, even for infants. Although the area just under the tongue can be quite delicate, reshaping the soft tissue with a laser is a very simple procedure for your child. No anesthesia is needed. Infancy can be an especially challenging time of life, especially for new parents or families that have babies with special needs. Getting a tongue tie treated can be confusing for some, especially when you’re not sure where to turn. Your pediatrician may recommend sedating your baby and having the frenectomy performed by another medical specialist, while a pediatric dentist might recommend completing the procedure in a hospital. Most of these medical and dental providers don’t have access to the lasers used by comprehensive dentists like Dr. Mansoor. As such, we’re able to provide infant, toddler, and child tongue tie treatments without a referral from your medical or dental practitioner. The procedure is quick, and your family can be in and out in less than an hour. If you’re still uncertain about whether your child needs a frenectomy, contact Smiles by Hanna in Gilbert, AZ. Dr. Mansoor is happy to meet with parents to discuss any feeding challenges that your baby may be experiencing. Should a frenectomy be the best option, we will schedule the short procedure as quickly as possible.